Affordable yacht co-ownership? In Dubai? Hmm. I admit, at first I was dubious! It sounded too good to be true but then I decided to find out more from SmartYacht to see how it all works. Chirag Shah, SmartYacht’s Middle East Managing Director, walked me through the hows and whys of yacht co-ownership and…I get it now. Don’t be too quick to judge based on price (like I did). When I first saw that the starter package is priced at 133,000 AED, I definitely suffered from sticker shock! But then I considered how it’s tax-free here and it wouldn’t be out of the question to split it with another couple. Or perhaps you’re a corporate honcho who is constantly entertaining. The initial investment is a drop in the ocean when you consider how your drop-out rate would decrease significantly if people knew they’d be aboard a luxury yacht instead of stuck inside yet another boring hotel room! Now, I myself am not a boat owner (I wish!). BUT, most of the people I know who have had boats in the past confess that they never used them as frequently as they would have liked. It’s rather like having a holiday home. You only stay in it for a small portion of the year but you’re still stuck with paying the year-round costs of running and cleaning the place. That’s the beauty of fractional yacht ownership—you get the luxury of having a yacht but without the full costs that come with owning one full-time. It’s literally as easy as hop-on, hop-off. The crew will prep the boat prior to your arrival, clean up afterwards, and take care of any deck work and hospitality so at the end of the day, you’re not only saving money but you’re also saving time (and we all know how precious that is these days). 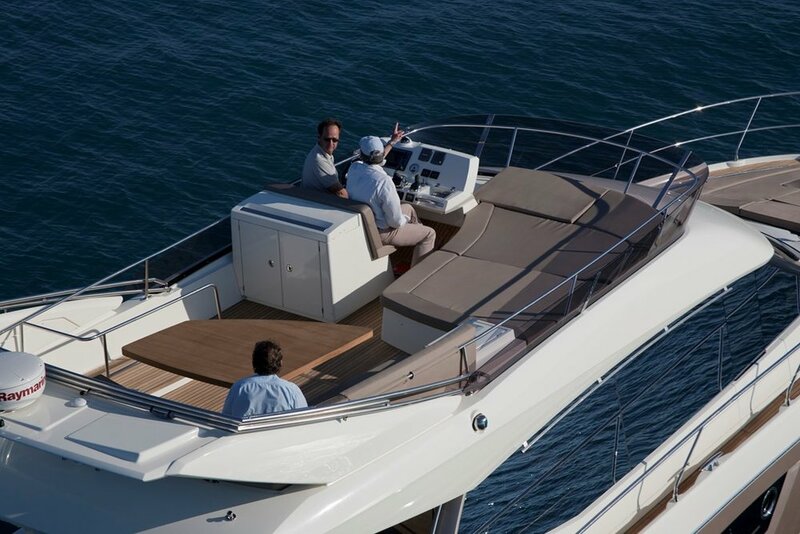 Whether you want to take the yacht out for a lazy evening of champagne and sunsets or on a thrilling weekend jaunt, this is a fantastic option for Dubaians who want to enjoy all the benefits of having a yacht without all of the accompanying costs and hassles. He and SmartYacht work off the stance that most people in Dubai love water, which I have to agree with. I really do think that living in Dubai turns us into water babies. Maybe it’s the constant blue skies, the warm (and sometimes unbearably hot!) weather that begs for the feeling of a breeze through your hair, those stunning sunsets over the Dubai skyline, or just being surrounded by water, from the magnificent Marina to the Palm. Or a combination of all of the above. But whatever it is, Dubaians love the water and few would say ‘no’ to being on a yacht! Think about it, the list of things you can do is endless! Day trips roaming around to all of the wonderful nooks and crannies of the UAE, sailing brunches (skip the standard hotel brunch and get out on the water! ), to, oh, let’s say a #TanAndTatt outing! (What’s that, you ask? Tanning and Taittinger champers, of course!) Really, you could have so much fun with a boat. In fact, the other week we hosted our first ever #CaviarConnect night on SmartYacht’s Prestige 500, one of the most luxurious yachts on the market today. Along with SmartYacht, we partnered up with Globaleye (an international wealth management group) and Cuvee3 to create the most fabulous Gin & Tonic Tasting Night whilst cruising around the Palm. It went absolutely swimmingly (and luckily, no one actually went swimming despite all of the gin and tonics!). There were ten of us inside the yacht doing the tasting, in addition to a few crew members, plus 50 or so glasses, and we never once felt cramped. It is perfectly spacious and my mind is reeling with ideas for future events! Honestly, it was such a perfect way to finish off a crazy week and we couldn’t have asked for a better inaugural #CaviarConnect night!